Sea Watch - Ocean Front with Beach, Incredible Views! 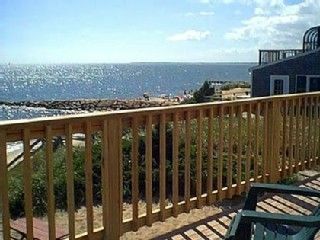 Our renovated 3 bed/2 bath ocean front home has the charm of Old Cape Cod with all the benefits of the new to provide the perfect place to create your Cape Cod memories! You can bring your pet with our permission. They are part of the family too. Incredible views from the living room, dining area, guest bedroom, master bedroom and the deck on the second floor that runs the length of the house. Queen beds in the master and guest, full bed in the third, whirlpool tub and separate shower in the master bath, full bath on the first floor, fully equipped kitchen.Outdoor enclosed shower with hot and cold water. Swim and sun on the beach, sit and watch the sea as the kids nap, read a book on the window seat in the master bedroom, cook on the gas grill and dine 'at the best ocean side table in the house'. In the fall and winter, cuddle up on the sofa in front of the fireplace after a walk on the beach. BR B Amenities: /B BR 2 queen beds, one full bed, 2 full baths, master with whirlpool tub, gas fireplace, full kitchen with dishwasher, coffee maker, toaster, microwave, all utensils, linens included, washer/dryer, cable TVs, WIFI. Activities: Close to biking, shopping, restaurants, antiquing, paddleboats, kayaks, whale watches, golf, mini golf.